Prime Minister Narendra Modi and French President Emmanuel Macron have said that India-France strategic partnership will play an important role in ensuring peace, security and stability in the Indian ocean region. In their Joint Strategic Vision for Cooperation in the Indian Ocean Region, both leaders said, peace and security in the region will bring robust economic growth and prosperity. The Joint Strategic vision said, India occupies a central position in the Indo-Pacific and it plays a pivotal role for the peace, security and prosperity. It said, France, a State of the Indian Ocean rim, is an important player in the region. 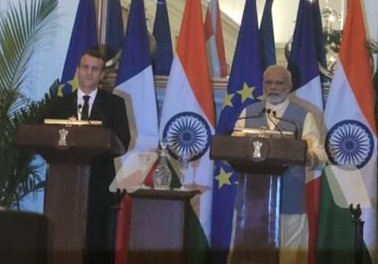 France and India have shared concerns with regard to the emerging challenges in the Indian Ocean Region including maritime traffic security in the face of the threats of terrorism and piracy, especially in the Horn of Africa, respect of international law by all States with freedom of navigation and overflight, fight against organized crime and combating climate change. To widen and deepen strategic naval cooperation, India and France will be open to inviting strategic partner countries in the region to participate in Indo-French naval exercises.